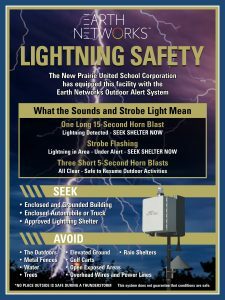 New Prairie High School is now equipped with an Earth Networks outdoor alert system. With over 1,800 sensors in nearly 50 countries around the world, Earth Network is the most extensive and technologically-advanced global lightning network. They have the ability to monitor in-cloud lightning which enables them to generate faster, localized storm alerts and warn of other forms of severe weather like tornadoes, downbursts and hail. A horn and strobe alert system are installed on the East side of NPHS. If you hear one long 15 second horn blast, please seek inside shelter immediately as lighting has been detected in our area. A flashing strobe light in the tower signifies that we are currently under alert. The strobe will stay flashing for 30min after the last lighting strike inside our protected radius. Three 5 second horn blasts signifies the all clear and activities are safe to resume. Be sure to familiarize yourself with the information above and seek inside shelter immediately when the system is signaling an alert. New Prairie coaches also receive alerts via email/phone. If an alert is issued, the countdown timer below will allow everyone to see how much time is left in the delay. The 30 minute countdown alert automatically refreshes with each strike inside the set protected radius.